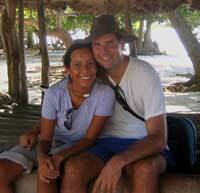 Jan 30- Feb 7, 2005 -- I would call the Maldives a perfect little coconut island! We made a late afternoon charge to arrive at the Port of Uligan just as the sun began to set. It was absolutely beautiful! The water is so clear here that you could see 60 feet straight down to the bottom. We could hardly wait to jump in the water after our 10 day passage. 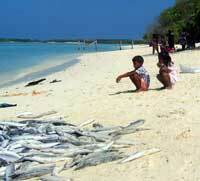 There is a lovely reef surrounding the island of Uligan that was teeming with fish. The island itself was covered with palm trees and dusted with a coat of pure white sand. 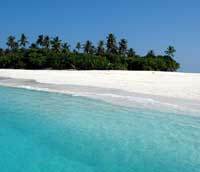 Uligan is located on the tip of the northernmost atoll of the Maldives. There are no resorts here. 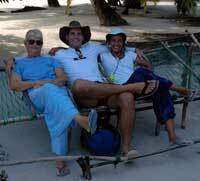 So this was a real Maldivian experience. The people of the Maldives are devout Muslims. On the island of Uligan, there was a small village with about 200 people. They live relatively simple lives by fishing and gardening. The cruisers definitely make for a daily entertainment. We spent 1 week at Uligan and had a fantastic time. On our first day here, customs and immigration came zipping out in a small speed boat. Five officials came aboard to get us all checked in so that we could go ashore. 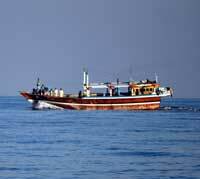 Just as they were about to leave, one of them spotted some squid right next to the boat. He promptly took out his fishing lure and caught 4 squid for us. There was ink squirting everywhere as the small squid demonstrated its ferocity. 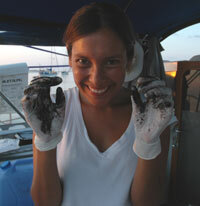 Now I have eaten calamari before, but I had absolutely no idea how to prepare squid before reaching the Maldives. After working up the courage to deal with the squishy squid, I discovered that preparing squid is a fairly easy but also messy job. Before you know it, you can be covered with black ink up to your elbows! The small village of Uligan was, literally, a neat place to visit. It was the tidiest village that I have ever been to. Instead of paving, the small streets were made of sand which was swept daily by the women in the village. The small houses were built like small adobes out of coral and surrounded by walls. 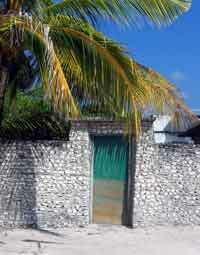 Inside their yards, people would have coconut, papaya, and lime trees growing. No cars here at all. You were lucky if you saw the one moped on the island. Scattered around the village were a few little stores, the marine agent office, customs offices, a small health center, a small school, one public telephone booth, and 2 mosques. Despite the simplicity of this place, the people here were truly modern. Most people seemed to have cell phones. The occasional house would have large satellite dishes. Every day when we would take the dinghy in to shore, one of the locals would run out to the dock to see if we needed anything … laundry, food, fuel, water … We soon learned that there was a little competition developing for the money of yachties. The people who live here, unless working for the government or a store, have no real form of income. During the cruising season which lasts for about 3 months, the locals try to make as much money as they can off the boats that are passing through. 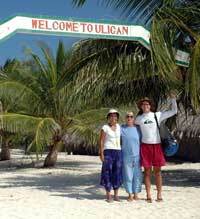 One of the highlights of our stay in Uligan was an island hopping tour that was put together. We jumped on a small local boat that took us to 3 surrounding islands. 2 of the islands were fairly well developed with larger populations (2000-3000 people), higher education, and harbors. As we walked around small groups of children would follow us. They were absolutely fascinated by David’s video camera. Many of them wanted their picture taken. We were definitely the tourist attraction around here. All the Maldivian people that we met were very friendly. We along with a group of yachties were invited to attend a traditional Maldivian dinner. The food was delicious -- a blend between Indian and Middle Eastern food with a tropical twist. We ate barbecued fish, curry, dahl (lentils), a tabouleh-like salad, roti (flat bread), rice, fresh fruit, and sweet tea. I may have to go back to the Maldives just for the food,. The island of Uligan is surrounded by a coral reef. With warm and crystal clear water, it was a pleasure to jump in the water every day. Just by looking over the side of the boat you could see schools of fish swimming by. The reef was, unfortunately, mostly dead. However, the fish life was fantastic! Colorful schools of fish were everywhere. I even discovered a large lobster hiding in a little cave. We considered making him into a meal, but decided he would be much happier living in a place like the Maldives. David was able to rig the video camera with an underwater viewer so hopefully we got some good footage of the reef. The fishing was fantastic too. Asides from the squid (which we continued to catch), Dave caught a large coronation trout that was a brilliant shade of red. The funny thing was that the hook had only been in the water for about 30 seconds when it was engulfed by the trout and then it was a life and death battle. Eventually, the fish made it into our cooking pot. 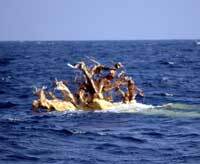 The Maldivians really depend on the ocean to supply most of their food. 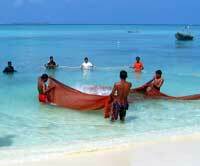 One day while we were on the beach, we saw a large group of Maldivian men wading in the shallow water and holding nets. The water had almost a frothed appearance from a large school of fish being brought in. Occasionally, one of the men would toss a fish like it was a football right on to beach where it would flop around for a few seconds. They must have caught about 500 fish that day. According to one of the officials there, all this fish would feed the island of Uligan for a good month. It was definitely the high point of the day for the village. Many of the women and children came out to watch the catch. 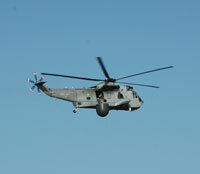 Well, after a great week in the Maldives it was off for Oman. It was a little hard to leave the Maldives knowing that this would be our last little tropical island. But from here we have all of the Middle East and Europe ahead of us. It’s going to be time to pull out our sweaters, long pants, and close-toed shoes. Somehow or another we will brave the cold! 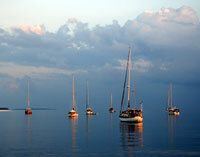 Feb 8-17, 2005 -- We set off from Oman with a large group of boats. There must have been over 30 boats sailing for the Oman and Red Sea all within a few days of each other. We had some great winds at the start of the passage. So we were rocketing along quite happily. However with an increase of speed, the motion of the boat can pretty intense. And I am afraid to say that I did get seasick one day. Thankfully, it did not last. On the way to Oman we saw lots of huge cargo ships making their way up into the Arabian Sea and the Red Sea. 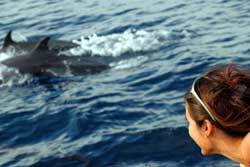 We had large schools of dolphins and whales come by to visit us. We talked with a few fishing boats over the radio. Dave tried out his Arabic, but we discovered that the boat was from India. They could hardly speak English, but were very friendly. They asked if we could speak Urdu or Farsi or Hindi … but no such luck. After a few days out, we started trailing our fishing lines and lo and behold we caught a blue striped tuna! It put up a heck of a fight as I reeled it in! What a beautiful fish, short and tubby with a silvery sheen! We fileted the tuna up and had a little for dinner. Some of the other boats that we were sailing with caught Mahi Mahi which supposedly tastes even better. We really tried for the Mahi Mahi with homemade lures made out of coke cans, letting out 3 fishing lines at a time, and circling around debris where they are known to live. But we had absolutely no luck. We will just have to wait till the Red Sea where the fishing is supposed to be amazing. Our real nemesis along this passage were not the large schools of fish roaming in the water, but the fishing lines that were 400-500 miles offshore. These nets were completely hidden by the water and had absolutely no markers. A few boats ahead of us got entangled in nets and it took them hours to cut the nets off. We kept a close look-out and were fortunate to not have any problems along the way. As we got closer to Oman we ran across 2 coalition warships. They sent out helicopters which circled around us to get a better look. They must have thought that we were a little strange as we waved like crazy. It was good to see these guys out and about. 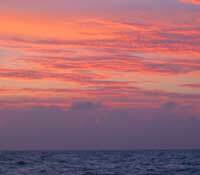 We hope that they travel in the Gulf of Aden where we will make our next passage. As we got closer to Oman we encountered “ublek” or should I say green and gooey algae. It was everywhere for miles and miles. What we discovered is that when the night came all the algae would phosphoresce. All around the boat were glowing swells and waves. Dave discovered that by swinging the boat around in a circle we left a very cool wake. 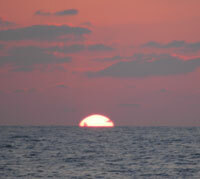 While on watch David saw dolphins gliding through the water that looked like glowing torpedos. What an amazing world! So after all these passage adventures, we arrived in Port Salalah, Oman after 10 days of sailing. What a different world! The Abbotts are looking forward to touring, eating delicious Arabic food, and hopefully a little off-road driving. Right now we are tucked into the harbor with 20 other boats. Really, “packed in like sardines” would be a more accurate term. I am definitely ready to get off the boat and explore! So stay tuned for more adventures!! February 18, 2004 -- We have seen, eaten, and conquered! We have just started to discover Oman. The Abbotts feel quite at home here since they lived in the Middle East for over 15 years. 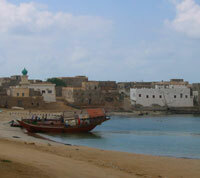 After finally getting clearance to leave the harbor, we set out to explore the town of Salalah. What we have encountered so far are friendly camels, ladies covered from head to toe in black, loads of foreign workers from India and Pakistan, delicious Arabic flat breads and yummy shwarmas (the middle eastern equivalent to the gyro, shwarmas are like the hamburgers of the middle east), mountains, deserts … There is going to be tons to do a see. Look forward to sharing more with you. 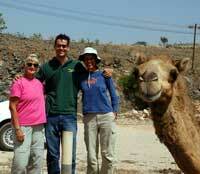 February 18-23, 2005 – The adventures continue in Oman! We are anchored in the middle of a small shipping harbor. As I look out my window, I can see fishing boats coming in to drop off the catch of day and huge cargo ships docking to pick up their next load of containers. Looking out from the ocean and the harbor, one can see arid plateaus and hills, and there is a long chain of mountains that line the horizon. What a beautiful country. 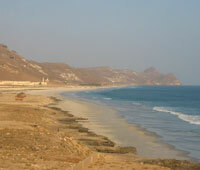 We have set out to explore a little of Oman every day by driving inland, and up and down the coast. On one of first days here, we decided to see what was just beyond the mountain range. Dave and David were hoping for sand dunes. While they lived in Saudi Arabia, the Abbotts were part of a Land Rover Club that would organize desert driving trips. Granted, we are driving a Nissan Sentra/Sunny, but getting stuck in sand could be a fun experience! Hopes were high, but unfortunately there were no sand dunes to be found. What we did find were miles and miles of military land that was used for a shooting range. 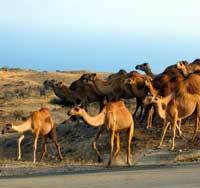 The only living things to venture into the rugged hills and shooting ranges are the camels!! 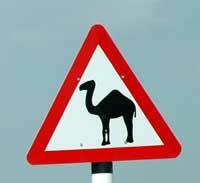 Camels are everywhere here in Oman! They pretty much have the run of the place. We ended up having a few roadside stand-offs when a herd of camels decided that the middle of the road was exactly the place they wanted to hang out! We set off to see the centuries old castles of Mirbat and Taqah down the coast. These castles were built in the 9th century by the local chieftains. Most of the castles sit high on hills and cliffs that overlook the ocean. From a distance, they look much like the adobe structures that one could find in the southwestern US. The majority of the castles were in very poor condition. 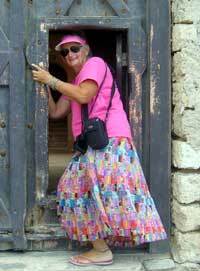 A few had been restored to their original splendor and had many artifacts to see – pots, jewelry, rugs, weapons … The doors to enter the castles were very low and small. Apparently this was a safety precaution. If someone entered who was an enemy, they would have to bend over and not see the hot oil or water that was waiting to be poured over them as they entered. Pretty sneaky, these Omanis! The castles were surrounded by dusty little towns that looked equally as old with dilapidated buildings and crumbling structures. As we drove up and down the coast, we have seen some amazing vistas and terrain. Every 5 minutes it seemed like we were jumping out of the car for another photo! It is so very dry here. I have not seen one river yet, but there are loads of dried out riverbeds that must get filled up every spring. There is not much in the way of vegetation except for lots of briar and the occasional scraggily tree. The rugged mountains follow the coastline and have crazy winding roads. Loads of fun to drive on! Much of the terrain here seems to be sandstone or limestone. The mountains are dotted with caves carved out by wind and water. Down by the beaches, the ocean has created some amazing blowholes. We all tested our courage by sticking our heads over a blowhole. You could hear the water churning down below with each crashing wave. And then a gust of wind and a cool spray would rush up from the blowhole. The town of Salalah is a bustling place. What I have been learning is that middle easterners are very nocturnal. The town comes alive after about 5 PM when it starts to cool down. The shops start opening and have all of their wares on display outside. The shops are organized into groups selling the same product. For example, you might drive down Jamel Street and all the shops sell mobile phones. Drive down Mohammed Avenue and you will see all the tailors, the grocers, the copiers … etc. In the evening, families start to come out and shop. The women here are clad from head to foot in black with their faces hidden behind a veil. The men often were long robes with scarves wrapped around their head. Being a westerner, as well as a woman, you often get stares here. Guess that I will just have to get used to it since we will be in the Middle East for at least another month. Another interesting thing here is that there are many people from Pakistan, India, Sri Lanka, and Bangladesh. The Omanis bring in foreign labor, and we are not just talking construction. They bring in 3rd world people to do all the work – cashiers, road cleaners, shopkeepers, restaurants, maids, doctors, nurses … and much more. 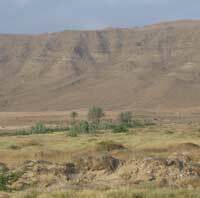 Some of the only real Omanis you will see out there working are the bedouins who live away from the towns. From what the Abbotts have told me, this is much like Saudi Arabia. The country is so wealthy from its rich oil supply that the native population doesn't need or want to work. What I want to know is what do the Omanis do all day if they are not out there working?! One of definite high points of my trip to Oman so far has been the cuisine! The food here has been absolutely delicious! Donna has introduced me to Middle Eastern cuisine. I think that you could call me a convert! I have discovered creamy hummus and moutabel (roasted and creamed eggplant with a few other spices) are delicious with warm Arabic flat bread. Salads such as babaganoush (eggplant, onion, tomato …), fatoush (lettuce, toasted bread, & spices), and tabuleh (tomato, onion, parsley, burghal …). And how could we forget shwarma, the Middle Eastern hamburger! Absolutely delicious with garlic sauce! And then there are bakeries everywhere with fresh bread hot out of the oven. I think that if we stay here much longer I am going to put on some weight!! Awwww ... can I keep him?